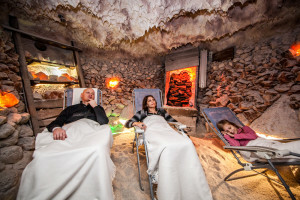 In our “Guest Book” you can find not only sincere thanks for a comfortable stay, repose and relax in the salt cave from our guests but also references about how the cave helped them. Several of them managed to ease their high blood pressure. The cures helped an 84-year-old pensioner in healing her chronic bronchitis. Another visitor says that after 10 visits in the cave she got rid of efflux of mucus and her headache in the area of her maxillary cavities stopped. We all agree with that and the rest of you also have your chances. Full of joy and enthusiasm were the children from the 1st form of Primary School in Lamac. The 9-year-old Klaudia wrote to our chronicle that she liked staying in the cave very much and drew for us a cheerful picture. Children from a kindergarten in Lamac attended the cave in groups five times a month. After staying in for as short as 10 minutes in the cave, their mucus started to get released thanks to the salt and since we made it into a game – the children were trying to win in snorting – truly, we hardly managed to wipe their little noses. A 45-minute stay always seemed too short for them and they would want to stay in longer to play with toys and salt in the cave. Their parents can fulfill this wish since all of you are always welcome here. Each visitor always leaves the cave after 45 minutes of resting with a smile on his face.